Forbes is the worlds leading business magazine and since its inception in 1917 its mission has been clear and unchanging: to provide insights and information that ensure the success of those who tap into Forbes. 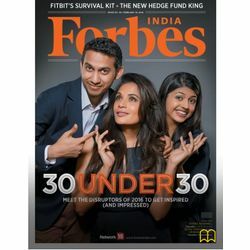 In India, Forbes is launched in partnership with Network18, Indias biggest full play integrated media network. Every fortnight, Forbes India will help you connect the dots, form patterns and see beyond the obvious. It will bring to light ideas and the people generating them, allowing you to get an edge as a professional and needless to say, it will also open up the potential for wealth creation. Our sharp, in-depth and engaging stories will look at global and domestic issues from an Indian prism, giving you a completely different perspective. Subscribe to Forbes India today and stay ahead of the curve.